My heart is heavy as I sit down to write this. As I sit down to try and capture the essence of someone who has had such a profound impact on my life and the lives of so many others. As I wrap my head around the news. It is with a broken heart and a tear-stained face that I share with you that on February 16, 2016, Nicole died from pneumonia. I cannot and will not say she lost her battle with cancer, because if you have seen one of her many posts, if you have watched one of her many videos, if you know anything about her, you too would know that Nicole cannot be beat. She just doesn't have it in her. I have written about Nicole before. When I asked, she quickly, graciously and excitedly agreed to let me share her story. Nicole has publicly shared her journey in hopes of raising awareness and in spreading her message that life is worth fighting for. She has done just that. 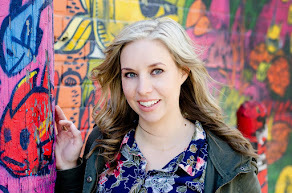 Nicole and I met as coworkers and while I saw her regularly at our old place of work, we reconnected by social media when she received her initial diagnosis. Something just affected, particularly the way she was dealing with her diagnosis. I reached out and she responded. Since that time we've had a number of conversations about her illness, struggles and just life in general. I treasure the confidence she placed in me, I honor the challenges she shared with me and I am so grateful I got to be witness of miracles that took place along her journey. 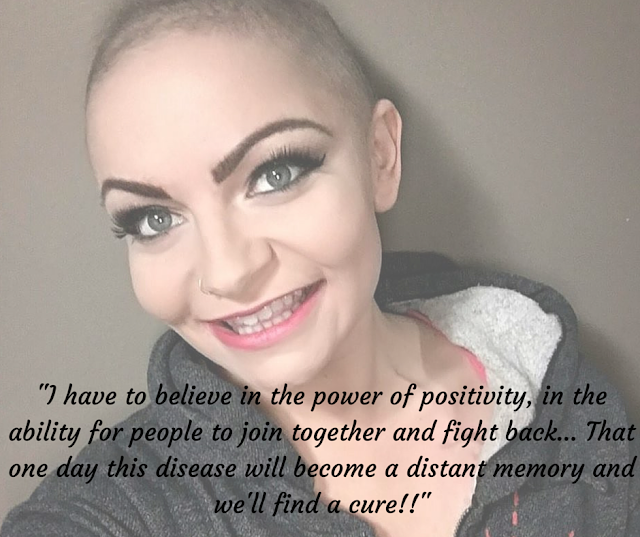 I will miss our chats and responding to her challenges that she put out to her many followers asking us to make her smile during her many hours of treatments. I usually spammed her with pics of my kid and always got a smiley face back. Many people aspire to cause some kind of change in the world, to leave the world a little bit better for them having been in it. To say Nicole accomplished this is an understatement. She inspired and continues to inspire so many. She encouraged people to be positive, to savor the beauty in the everyday, to enjoy every moment and to be kind. She changed the world by just being her. That's the real beauty of Nicole. She lived her life the only way she knew how, with a tenacious fever and she let cancer and everyone around her know she would not give up. She NEVER gave up. She did all this with love in her heart and a smile on her beautiful face. The best part? She bravely shared her journey with all of us. 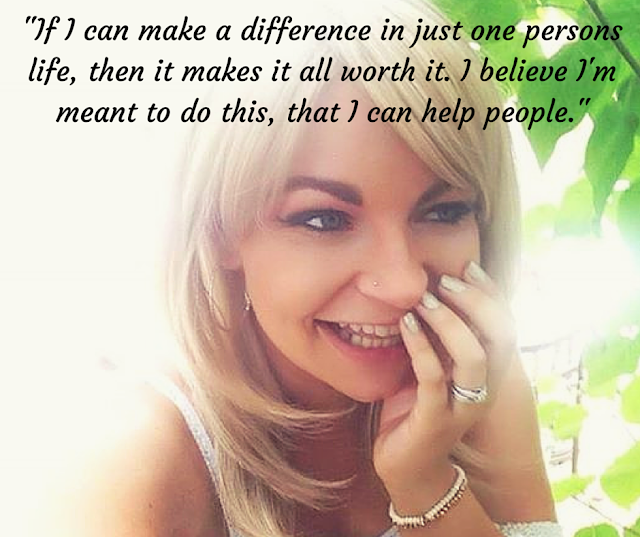 Nicole, early on, made the decision to share her story, to share her fight. She was inspired and encouraged by her many followers and them by her. Each picture she posted, you could literally feel the light emanating from her smile. As much as she helped us all, I know we helped her too. When she was so tired, it was all of those looking to her who gave her the will to continue, she told me that. She encouraged people to love each other, to help each other, to not complain too much or wallow, to be thankful, to be grateful, to LIVE. Whether you are her best friend or a stranger in another country, Nicole has the innate ability to affect people. It has been nearly impossible for anyone I know to read her story and forget about it. Once anyone sees how she takes life on, they just can't stop reading. 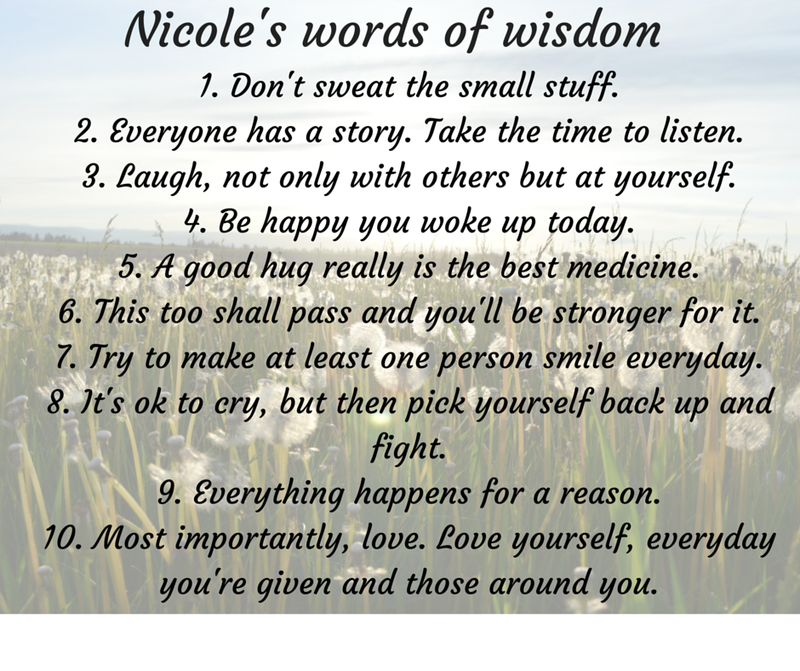 If you've been touched by Nicole's story, change your perspective, live your life, be happy, be grateful and don't take what you have for granted. I remember talking to Nicole on Facebook messenger and talking about parenting struggles and how it seemed trivial to talk about to her. Nicole, being so kind and wise, said that her struggles weren't any more or less than mine, they were just different. She reminded me we all have our 'stuff' and it's how we deal with that and welcomed a chat about my mommy-woes. Wow, right? From that moment my attitude changed. It still sometimes needs adjusting but thanks to Nicole, I have the ability to do that. I have her as a point of reference. She gave me that gift, I vow to not waste it. Lastly, I am going to share a video Nicole posted about Metastatic breast cancer and ask that you watch it... please watch it, listen to her words and share it. There's not enough being done, there are too many people losing their lives and this needs to change NOW. Please take the time to share my video and help raise awareness for Metastatic Breast Cancer! All I want for my birthday is to help turn my terminal disease into a chronic one!! Nicole's legacy is in her memory, it is in every single heart and life that she touched and we all have the honor of helping her continue it. Nicole's light is one that can never be put out, she lived her life the only way she knew how and we are all better for it. You will be missed sweet friend but your strength and beauty lives on in all of those who had the honor of knowing you and in all those lives you've altered forever. I am a better person for having known you. I'm so sorry for your loss. She seemed like an amazing woman- sending you love and light during this time. A beautiful tribute to your friend.